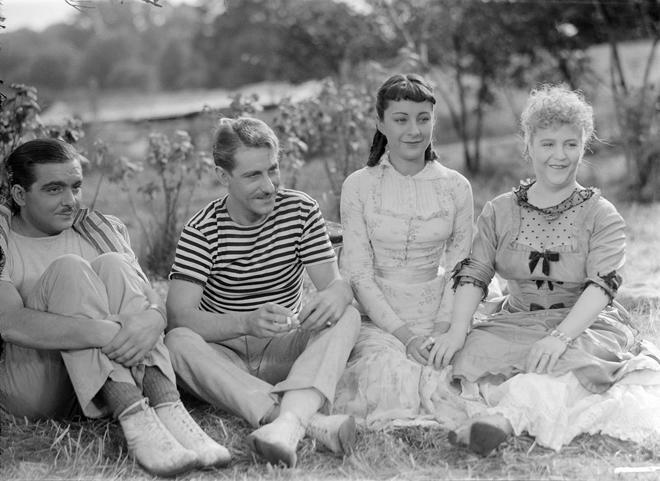 This bittersweet work from Jean Renoir, based on a story by Guy de Maupassant, is a tenderly comic idyll about a city family’s picnic in the French countryside and the romancing of the mother and grown daughter by two local men. Conceived as part of a larger project that was never completed, shot in 1936, and released ten years later, the warmly humanist vignette 'A Day in the Country' ranks among Renoir’s most lyrical films, with a love for nature imbuing its every beautiful frame. Carrying any film from conception to completion can be a daunting task. In fact, sometimes movies actually don't end up finished at all. Whether from issues related to scheduling, financing, creative disagreements, or even untimely deaths, some productions never reach their planned ends. Such is the case with Jean Renoir's 1936 effort, 'A Day in the Country.' Though always intended to be a short film, the forty one minute movie is still missing about fifteen minutes worth of footage that was never shot. Assembled from the available material without Renoir's direct involvement, the resulting picture remains a very worthy entry in the legendary French filmmaker's celebrated body of work. Despite its technically incomplete status, the film reveals early examples of several stylistic techniques that the director would go on to perfect in subsequent masterpieces, offering a deceptively simple cinematic dalliance among the wistful countryside. Based on a short story written by Guy de Maupassant, the narrative focuses on Monsieur Dufour's (André Gabriello) Sunday trip to the country with his family in the summer of 1860. While the group enjoys their peaceful surroundings, two local men (Georges D'Arnoux & Jacques B. Brunius) decide to make advances on Madame Dufour (Jane Marken) and her daughter, Henriette (Sylvia Bataille). Swept up in the beauty of nature, Henriette flirts back, but time and circumstance might prevent love from ever blossoming. While shooting was never completed due to scheduling and production issues (and a few scenes were actually filmed without the director on set), the edit presented here was compiled by Renoir's collaborators from the footage shot and was released in 1946. To compensate for some missing pieces, two intertitles have been added to clarify certain details about the plot and characters. Thankfully, this addition is fairly unobtrusive and despite the film's technically unfished nature, the runtime feels mostly cohesive and satisfying, resulting in a bittersweet story full of emotion and subtle visual poetry. The majority of the script simply focuses on the family's idyllic and sometimes comical experiences in the countryside -- picnicking, swinging, fishing, and boating in the river. A few light-hearted squabbles are thrown in as well, but the majority of the film's drama stems from one of the local' men's flirtations with Henriette. This courtship starts out innocent enough, but eventually takes on a more passionate air, leading to the story's central conflict. Throughout it all, the cast does a great job of balancing the mostly carefree tone with other more wistful revelations. Georges D'Arnoux & Jacques B. Brunius are particularly fun as the pair of rogues out for seduction, and D'Arnoux ultimately exposes a deeper side to his character. But at the end of the day, this is really Sylvia Bataille's film, and the actress is exceptional as Henriette, layering the woman with joyful bursts of youth and more complicated pangs of melancholy. Serving as an important stepping stone in the director's evolving style, Renoir employs many of the trademark cinematic techniques here that he would later develop further in masterpieces like 'La Grande Illusion' and 'The Rules of the Game.' To this end, the movie usually avoids close-ups and traditional coverage in favor of wider shots, layered compositions, and reframing images that move from character to character in extended takes. This technique allows the director to draw deep visual connections between the ensemble -- tying them together or separating them spatially and emotionally through camera movements. Likewise, the long tracking and panning shots enhance the atmosphere, making it always seem as if the world continues to exist beyond the edges of the frame. Occasional cutaways that focus on nature also help to imbue the work with a kind of visual lyricism, using images of rustling trees and rainy rivers to complement the story's emotional turns. And while true close-ups are rare in Renoir's work, the director offers one of his most striking close shots during the movie's climax. Framed on Bataille's face during a moment of complicated emotion, the image is made all the more powerful thanks to its stylistic break from the movie's usual aesthetic, and easily ranks among the celebrated filmmaker's most affecting compositions. 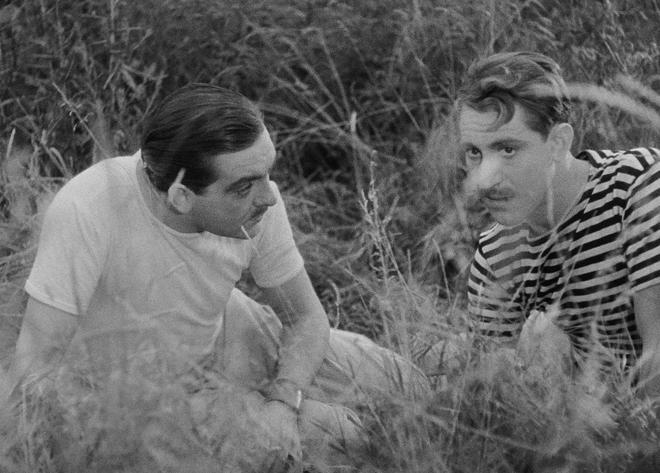 On that note, despite its short running time and unfinished nature, 'A Day in the Country' still feels like a full-fledged effort from Jean Renoir. The picture might lack most of the social criticism and political content that marks many of the filmmaker's other notable works, but the comparatively light and brisk narrative is brought to life through their same rich texture and expressive visual form -- offering a unique and beautifully bittersweet detour in the director's treasured filmography. Criterion presents 'A Day in the Country' in their standard clear case with spine number 746. The BD-50 Region A disc comes packaged with a pamphlet featuring an essay by film scholar Gilberto Perez. Sourced from a composite fine-grain print and scanned at 2K resolution, the movie is provided with a black and white 1080p/AVC MPEG-4 transfer in the 1.37:1 aspect ratio. With little in the way of damage, this is a strong image that highlights Renoir's expressive images beautifully. The print is in great shape with only very minimal signs of age here and there. A moderate to heavy layer of fine grain is present throughout, adding some natural cinematic texture to the image. With that said, the grain has a predominantly fuzzy quality and there are some rare instances when it appears a tad static and noisy. Though on the soft side, clarity is still very pleasing, offering a solid sense of detail and dimension throughout the many shots of idyllic French countryside. The greyscale is also well maintained with mostly even contrast, but black levels are a bit elevated. 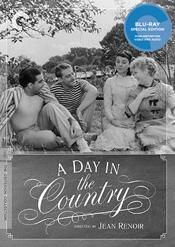 With negligible damage and no major digital artifacts, 'A Day in the Country' comes to Blu-ray with a very handsome transfer, doing justice to Renoir's delicately lyrical images. The audio is presented in a French LPCM mono track with optional English subtitles. Though understandably limited, the mix is free from any major technical issues and suits the content very well. Speech is easy to understand throughout but does have a slightly muddled and flat quality. The design work itself is very modest, with appropriate but minimal nature effects in the background of the single channel of audio. Joseph Kosma's beautiful score sounds rather lovely with solid dynamic range, and the wistfully powerful melody bolsters the narrative and visuals perfectly. Notable pops, crackle, and hissing are thankfully absent, resulting in a simple but effective track. Despite the film's short running time, Criterion has put together a very comprehensive collection of supplements, including an extensive reel of outtakes and analysis of the shoot. All of the special features are presented in 1080p with Dolby Digital 1.0 audio and English subtitles for the foreign language portions. Introduction by Jean Renoir (HD, 6 min) – Recorded in 1962, this intro features the director discussing the movie's origins, his desire to create a short film, the adaptation process, shooting conditions, and the production. The Road to A Day in the Country (HD, 25 min) – Here we get an interview with Jean Renoir scholar Christopher Faulkner. Faulkner discusses the film's unique production history, incomplete status, and larger place in Renoir's filmography. Pierre Braunberger on Jean Renoir (HD, 6 min) – This is a 1979 interview with the producer of the movie. Braunberger elaborates on Renoir's passion for film, the movie's production, and what it was like working with the director. Renoir at Work (HD, 16 min) – Here we get a video essay by Christopher Faulkner examining outtakes from the film's shoot. Faulkner analyzes Renoir's directing methods and style, and points out scenes shot when the director was actually absent from the shoot. Un tournage a la campagne (HD, 89 min) – This is an assemblage of outtakes from the shoot, culled down from about four and half hours of preserved raw footage. We get to see footage not used, lots of alternate takes, and some very interesting peeks at the famous director in action. Screen Tests (HD, 10 min) – Screen tests featuring the cast are included. Though there is no on-set sound, the images are presented against music from the film. 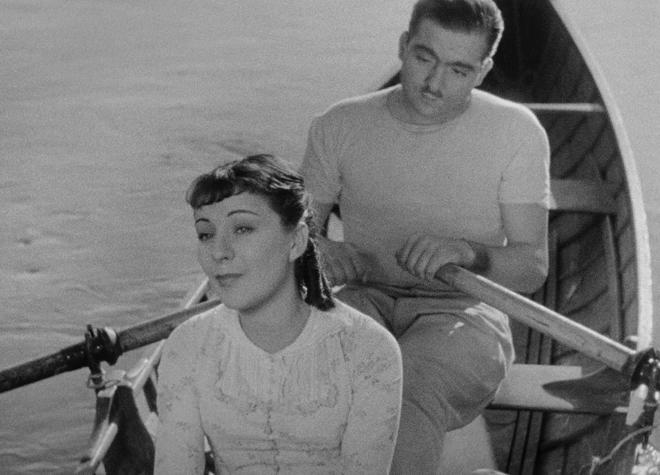 Jean Renoir's 'A Day in the Country' occupies a unique and important place in the director's filmography. The short highlights many of the stylistic techniques that the filmmaker would go on to develop in later works, and despite its technically incomplete state, the movie still feels like a full-fledged effort. The video and audio are both very pleasing and serve the content well. Supplements are surprisingly robust and informative, including a reel of outtakes that is actually longer than the main movie itself. Though it might be a little unfair for Criterion to charge full price for a short film release, this is a rather comprehensive package and the movie itself is quite lovely. A slightly discounted MSRP would have been welcomed, but the title is still recommended.